When plant growth is affected by adverse growing conditions or when excessive amounts of nitrogen are available in the soil, nitrates not converted to protein then accumulate in the plant stems and leaves. Nitrates are converted to Nitrites, which interfere with the hemoglobin in the animal, reducing the normal transport of oxygen by the blood. Symptoms: Low body temperature, reduced consumption, weakness/low muscle tremors. Lower third of the maize stalk can contain up to 80 times more nitrate than leaves. High nitrates increase the buffering capacity in the forage making it more difficult to ferment. This can allow undesirable bacteria such as clostridia and enterobacteria to grow. Higher acetic acid concentration and dry matter losses can be a result. Figure 1: Cornell University (nitrates-N content in ppm). Test silage for nitrates content before feeding. Adapt cows to nitrate containing feeds in a controlled manner. A well fermented silage reduces nitrates by 30 – 50%. Utilise a specific forage inoculant. 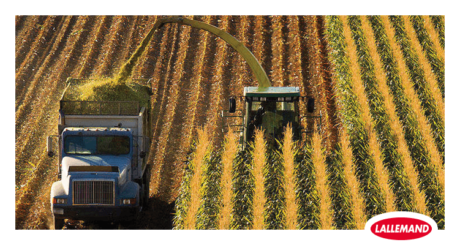 Silage fermentation may produce several kinds of gas, including carbon dioxide and nitric oxide. Although carbon dioxide is non-poisonous, it can cause suffocation. Nitric oxide changes to nitrogen dioxide when it reacts with oxygen in the air. Nitrogen dioxide (NO2) is poisonous and can injure and kill people as well as livestock. NO2 is a heavy gas, orange in colour and normally accumulating in lower parts of the silo/bunker. Smells like some laundry bleaches. Nitrogen dioxide gas is normally formed in the silage during the first 12 to 60 hours after filling. Be careful if bleach-like odors and /or yellowish-brown fumes are noticable near the silo. If gas is apparent, check that it is not entering barns or areas where employees are likely tobe working. Do not approach a silo emitting visible gas for at least 10 days, if possible leave for 2 weeks. Place warning signs and advise children clearly to stay away.